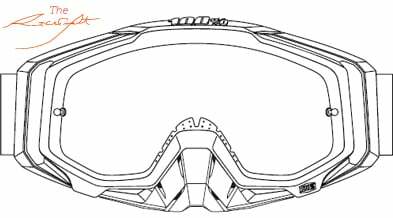 100% Racecraft Premium motocross goggles are brought to you by 100% (Ride 100 Percent). The premier 100% line of goggle system represents our commitment to create an enhanced user experience by providing riders with a higher level of functionality and accurate vision. The Racecraft is a synthesis of precision engineering and minimal design, which produces a goggle that performs and feels as great as it looks. 1 - Outriggers: Helping to achieve perfect fit and balance. Racecraft has outriggers to help the goggle sit evenly and snugly against the face. The outrigger system makes the Racecraft feel comfortable. A tear off post is affixed to the outrigger, which stops the nuisance of a sliding tear off clip. 2 - Removable Nose Guard: The attachment of the 100% nose guard is a unique incorporation of the frame co-molding to insure stability and protection in the most testing condition. 4 - Lens: Anti-fog coated Lexan lens for flawless vision. The frame has a raised section at the top of the lens to offer a bit more vision, and the peripheral landscape is incredible. Most riders prefer a clear or mirrored lens, but 100% goes the extra mile by including both lenses with the goggle. 5 - Strap: The Racecraft goggle has a strap that’s as wide as a landing strip. At 45mm wide, the elastic strap is robust. It’s also has a wide bead of silicone prevents the massive strap from sliding. 6 - Co-molding: This feature allows the incorporation of patent pending technologies into the frame while still holding 100% performance and styling true. 8 - What's in the Box? : The Racecraft goggle arrives as 4 Goggles in 1 with the options you can choose from. You get a Mirrored Lens, an Extra FREE Clear Lens, Removeable Nose Guard and 20 standard Tear-Offs. 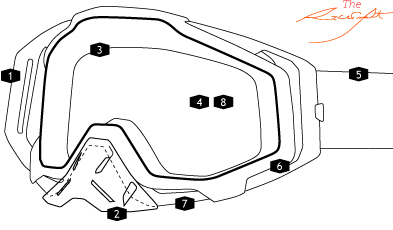 Buy 100% Racecraft Motocross Goggles at Dirtbikexpress, the UK's favourite motocross store.